Detoxification is a natural and ongoing process performed by your elimination organs: your liver, colon, kidneys, lungs, lymphatic system and skin. And all day, everyday, your body is working hard to eliminate toxins from both internal and external sources. For example, your liver is constantly filtering harmful or unwanted substances and converting them into less harmful forms ready for excretion. Some of these substances are made by your body – but no longer needed – such as cholesterol or excess oestrogen and other hormones. Some experts will say that these automatic detoxification processes are all we need. And, if you are feeling energetic, your skin is radiant and your digestion is working well then perhaps they are enough. But, if you feel sluggish or fatigued, have trouble concentrating or sleeping, catch colds easily, suffer from allergies, have pimples or skin rashes, bloating or constipation or just feel like things are not humming along as well as they could be, then perhaps your elimination organs could do with a little extra support. For many, the cosmetic signs of an overloaded liver are often the first to manifest and can include skin rashes or breakouts, eczema, rosacea and cellulite. Detoxing is by no means a silver bullet that will fix all ailments and if a health or skin condition is troubling you then you should definitely consult with your healthcare practitioner. But gently cleaning up your diet is often a good place to begin improving your health. You could compare it to cleaning your house. You need to pick everything up off the floor before you can begin to vacuum – and you need to remove clutter before you can dust the shelves. Likewise, avoiding processed or fried foods, added salt, refined sugars, trans fats, food additives, pesticides, caffeine, cigarettes and alcohol are all good ways to begin cleaning your internal ‘house’. By avoiding these additional toxins, it can make it easier for your hardworking elimination organs – especially your liver – to work more efficiently and detox a little more deeply. Nourishing yourself with vitamins and minerals from wholefood sources is another way to support your detoxification pathways. Add CLEANSE Inner Beauty Powder to your inner beauty routine. Containing 45 Certified Organic and bio-fermented fruits, vegetables, seeds, roots, algae, grasses, purifying herbs, digestive enzymes, prebiotics and probiotics, CLEANSE supports your body’s natural detoxification processes from the inside, out. It can be taken daily as part of your inner beauty routine to help rebalance the body and gut microbiome – or, enjoy it as part of The Beauty Chef’s 14-Day Cleanse Program. This unique formula has been developed using The Beauty Chef’s exclusive Flora Culture™ bio-fermentation process which supercharges the ingredients, making them more potent and bioavailable for the body to use – as well as creating a broad-spectrum, food-based probiotic for a beautiful belly and clear radiant, skin. The more you move, the better your blood and your lymph fluid will flow – remember, you must move it to lose it. In fact, your lymphatic system only moves when you do. Low-intensity exercise such as walking, rebounding, swimming, rowing or cycling on a stationery machine, pilates and yoga can all get your lungs breathing more deeply, your lymphatic system flowing and your heart pumping. Plus working up a gentle sweat helps expel toxins via your skin. Purchase CLEANSE Inner Beauty Powder and we will send you a copy of the 14 Day Inner Beauty Skin Cleanse Program packed full of educational information from The Beauty Chef as well as Menu Planning inspiration and Recipes! Hot stone massage therapy melts away tension, eases muscle stiffness and increases circulation and metabolism. Hot Stone Massage Therapy promotes deeper muscle relaxation through the placement of smooth heated stones at key points on the body. Our professional therapists also incorporate a customised massage, with the use of hot stones which offers enhanced benefits. The premise behind hot stone massage therapy is that the direct heat of the stones relaxes muscles, allowing the therapist access to their deeper muscle layers. Combining hot stone protocols with massage provides a very healing and effective experience. The hot stones also expand blood vessels, which encourages blood flow throughout the body. The hot stones have a sedative effect that can relieve pain, reduce stress and promote deep relaxation. It’s not just the ocean sounds and delicious smelling oils that immediately take you to a stress-free space, massages have been found to increase blood flow to areas of the brain associated with mood and stress regulation. A study showed that after a massage treatment, people’s levels of the stress hormone cortisol dropped by 31 percent while happy hormones like serotonin and dopamine were boosted by 30 percent. This enables the body to enter a recovery mode. Moreover, this form of therapy also triggers lasting feelings of relaxation, improved mood, and reduced stress levels. Regular massage therapy sessions have been found to reduce blood pressure levels. Consistent massage sessions can also reduce trigger sources for anxiety, hostility, tension, and depression. In turn, lower blood pressure levels can also reduce the risk of heart attack, stroke, and/or kidney failure, as well as many other health issues. The purpose of massage therapy is to target the source of the body’s pain via eliminating tense muscles, increasing flexibility, and providing relaxation to the affected muscles as well as the body as a whole. Massage also promotes circulation to the affected or injured muscles, which increases nutrients and oxygen to the damaged tissues. In turn, this increased activity to the affected sites reduces stiffness and edema (swelling) in the muscles and joints, as well as increases flexibility to help reduce pain. Furthermore, this form of therapy also releases endorphins (pain-killing hormones), which boost the dopamine and serotonin levels in the body. These hormones assist the body in many ways–physically as well as emotionally. Case in point, they promote healing, pain management, and feelings of euphoria, as well as help to calm the nerves. The long-term benefits of massage therapy are not to be underestimated. Improved circulation is part of a snowball effect that occurs in the body as a result of receiving regular massage therapy on a consistent basis. This is because proper circulation brings damaged, stiff, and tense muscles the rich blood supply they need to promote healing. Regular massage sessions provide many benefits to the human body. It is a well-known fact that people who experience high levels of stress are more vulnerable to illness and injury. When stress is combined with sleep disturbances and poor nutrition, the impact is directed at the body’s immune system. Its ability to naturally protect itself against infections, pathogens, and bacteria is greatly reduced. Some might wonder how massage therapy benefits the immune system. Studies have indicated that regular massage sessions not only help reduce stress, but can also boost the immune system’s cytotoxic capacity (activity level of the body’s natural “killer cells”) and enhances the body’s ability to deliver nourishment. Massage therapy can be a great addition to any exercise program. Much like regular exercise can keep the body fine-tuned, regular massage therapy can help keep the immune system strong and resilient. This form of therapy involves hands-on techniques to increase circulation, relieve tension, reduce stress, relieve anxiety, improve sleep, and promote relaxation throughout the entire body, as well as many other benefits. How to get Great Skin in 20 Minutes! LED Light Therapy. What is it, how does is work its magic and is it really safe for our skin? LED (Light emitting diode) is a non-invasive skin treatment that uses LED light bulbs to emit different wavelengths of light energy, that target deep into the skin cells for multiple skin and anti-aeging benefits. It is a painless and relaxing treatment that is cost effective with amazing results, safe for all skin types and colours. 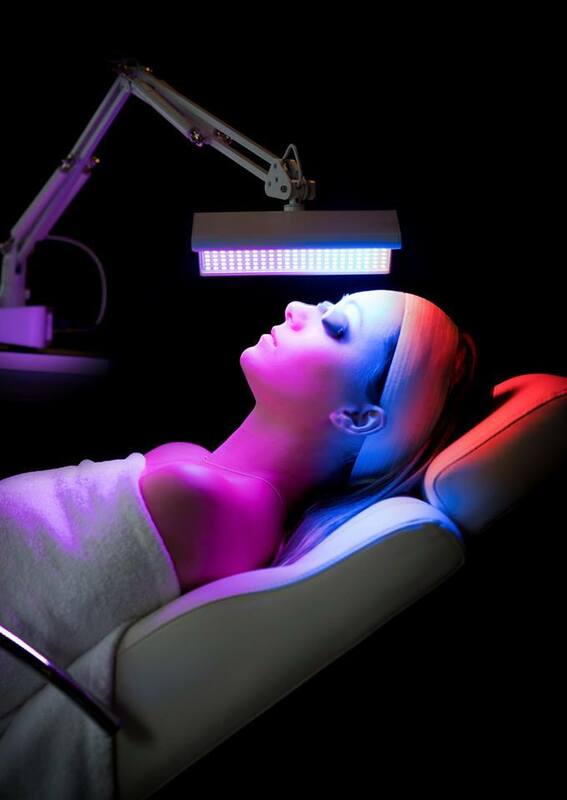 LED has an array of different bright coloured lights, LED is usually used in combination with other Skin treatments for optimal results and is an ideal treatment to have before and after microdermabrasion and skin peels to help accelerate the healing process and maximise your treatment benefits, increases blood flow to skin tissue. LED works harmoniously with your body’s own natural processes of synthesis and repair to restore an overall state of balance and wellbeing to the skin. Working with the power of light to make you glow! Photo-rejuvenation uses LIGHT ENERGY to stimulate the skin’s own natural cellular metabolic processes, to heal and rejuvenate and, once triggered, these healing reactions continue even after the light is removed. RED light therapy is anti-ageing, specifically targeting more mature skin types, the light stimulates collagen and elastin synthesis, firming and tightening the skin. It also has an anti-inflammatory effect and helps to balance pigmentation. The higher frequency BLUE light therapy is used for the treatment of acne; the BLUE light targets and destroys the acne vulgaris bacteria. It also helps to reduce inflammation and accelerate the healing process. Combination Treatments are highly recommended for the best results! Combine your favourite facial treatment with LED Light Therapy to enhance and power your facial to a whole new level of performance. LEDs (Light Emitting Diodes) are Low Level Light Therapy (LLLT) designed to deliver a specific light wavelength at a lower regenerative intensity, with no cellular damage. LED Light Therapy is completely painless. Can led light therapy burn or harm the skin? NO! LED Light Therapy is a non-invasive natural therapy; it is 100% safe and painless. 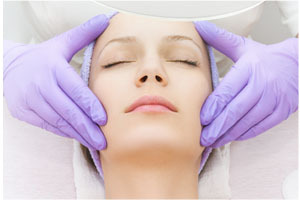 It is a relaxing and calming experience with NO adverse side effects or client downtime. Clients may experience a slight and comfortable warming of the skin as the LED Light energises the skin cells. Want Fast Anti-Aging Results with Minimal Down Time? What is an Azyme Peel? Our Ultraceuticals A-Zyme peel or skin workout has long been one of our favourite Advanced Skin Treatments, but now it is 'NEW & IMPROVED'! This Star Performing Paramedical treatment contains exclusive Ultra-Reti microparticles, an advanced delivery technology for Retinol. Developed to support the skin's epidermis and dermis, this treatment will smooth and dramatically soften the appearance of fine lines and wrinkles. In addition to the pure Retinol (1%), the A-Zyme is also supported with the additional benefits of Bromelain Concentrate (8%). Bromelain improves the visual appearance of the skin by digesting the keratin of dead skin cells, therefore accelerating the turnover and exfoliation of these cells which helps to even out skin tone and dramatically refine the texture of the skin. So why do you need Vitamin A in your skin? Vitamin A has a small molecular structure meaning its able to get to the lower layers of the skin to work from the inside out. It is an extremely effective cell-communicating ingredient which means it can connect to almost any skin cell and tell it to behave like a younger, healthy functioning cell. It works by promoting skin cells to regenerate at a faster level bringing through fresh young skin cells and getting rid of old damaged ones! With all this cell turnover it is now producing a lot more hylauranic acid, (our skins own natural hydration) giving the skin a fresh glow. One of its most powerful qualities is its ability at normalising and regulating oil production (amazing for acne or breakout prone skin with in-salon treatments and home care use). The anti-aging effects of Retionl on the skin have been broadly acknowledged and widely documented. Clinically Vitamin A has been shown to promote the deposition of new collagen and prevent its degeneration (reduces fine lines and wrinkles). In addition it reduces pigmentation and sun damage as it acts like a “jack-hammer” breaking up the damaged melanin cells in the deeper layers of your skin, bringing them to the surface where they can be exfoliated off! As your oil flow slows down and you are producing more collagen, your pore size will slowly start to refine and shrink in size making them less visible to the naked eye. If you can imagine a technologically advanced peel that provides real visible results without discomfort, minimal to no redness making it a great “lunch time” peel allowing you to go about your day with no signs of had having a peel. Three days after your peel you may experience some “shedding” or light flaking of the skin, however using the Ultraceuticals post peel products will reduce this downtime and ensure best results. If you are looking for best results, I recommend this as your go to peel. It's definitely my favourite! What is Hyperpigmentation and How can we Treat it? Pigment spots such as age spots are caused by sun exposure. When there's dark discoloration on the skin, too much melanin has been produced. For this reason, they appear mainly on body parts that are frequently exposed, such as the face, hands and arms. They tend to be small, darkened patches of skin. Factors like the UVA rays in sun "turn on" your pigment-making cells called melanocytes, which then pump out melanin to protect your skin. While that means a tan for many, the process can also cause dark spots and patches to crop up in over-exposed areas. Sometimes, spots can take a decade or two to show up, so if you've got hyperpigmentation making an appearance now, the damage may actually have come from your child or teen years. Melasma is often referred to as “the mask of pregnancy”, as it affects up to 90% of pregnant women. It occurs as a result of hormonal influences such as pregnancy and birth control pills, and causes dark and irregularly shaped areas on the face or arms that can be quite large. Post-Inflammatory hyperpigmentation occurs when a skin injury or trauma heals and leaves a flat area of discolouration behind. It’s commonly found among acne sufferers, and can also be caused by cosmetic procedures such as dermabrasion, laser treatment and chemical peels. How can we Treat Hyperpigmentation? 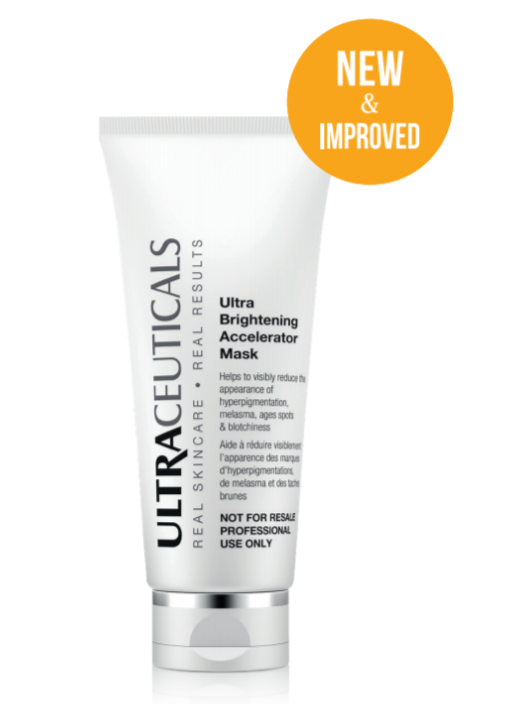 One of our favourite Professional Only Cosemeceutical Treatments is our Amazing Radiance Plus+ which makes use of the Ultraceuticals 'Ultra Brightening Accelerator Mask'. This treatment is designed for skins concerned with hyperpigmentation and post inflamatory hyperpigmentation and is suitable for skins of fitzpatrick 1-6. The mask combines a powerful blend of 8 skin brightening agents that work in synergy to rapidly reduce the appearance of hyperpigmentation, dark spots and blotchiness to instantly reveal a luminous complexion as well as inhibit the future formulation of melanin for a more uniformed and lighter skin appearance with minimal discomfort to the skin. For more detailed information and advice on how this treatment could help improve YOUR skin, why not book an appointment with one of our expert skin therapists for a consultation. Hyaluronic Acid is a powerful skincare ingredient. But don’t let the word “acid” put you off. This gel-like water-holding molecule is a moisture-binding ingredient that helps keep skin plump and hydrated. And, it’s actually something our bodies naturally produce. Hyaluronic Acid helps retain over 1,000 times its weight in water within the cells of skin, making it an excellent moisturiser. Scientific studies have shown that Hyaluronic Acid helps improve skin hydration and production of collagen, fight free radicals, maintain skin elasticity, and even has antibacterial and anti-inflammatory properties that help with wound healing. Yes, please! So why do we need more if our bodies already produce it? Well, the average human body contains about 15 grams of Hyaluronic Acid. However, one third of that gets degraded and synthesised on a daily basis. We also produce less and less as we age. So we need more, which is why many anti-ageing products contain Hyaluronic Acid. Just choose a serum or moisturiser that contains Hyaluronic Acid (also commonly listed as Sodium Hyaluronate) for softer, smoother, more hydrated skin. Have you heard about Threading? Eyebrow threading is an ancient hair-removal technique, practised for centuries among the most beautiful women of Asia and the Middle East. It is the best alternative to waxing and tweezing. This method creates a graceful brow with clean, well-defined edges that frame the eye. Our threading therapist takes a thin cotton thread and twists it into a double strand, which then is swept along the skin. With rhythmic – almost hypnotic – movement, the unwanted hairs are secured in the thread and lifted from the follicle with precision and finesse. Many of our customers agree that threading causes less discomfort than waxing. Because it targets individual hairs, threading keeps skin irritation to a minimum. Excessive pulling on delicate skin around the eyes is eliminated, and for those sensitive to waxing products, there is no exposure to irritants or heat. How long does threading take? A simple eyebrow threading can take just 5-7 minutes. The upper lip takes about 3 minutes; a full face thread takes about 15-20 minutes. Is threading better than waxing? Yes threading is known to be a superior option to tweezing, sugaring or waxing. This eastern method of hair removal eliminates the chance of your coming in contact with wax that is too hot for tender facial skin. Hair is removed from the root so there’s less of that “grow-back factor.” This extends the time between salon visits, saving time and money and maintenance in front of the mirror! …And, because of the precision involved, “threaders” can hone their artistry, creating perfect brows for everyone’s unique face shape and personality. What’s the main benefit of threading vs. other hair removal method? Threading’s main benefit is the manner in which the eyebrow is shaped-not just from underneath, but also from the top. One of the major drawbacks of tweezing, especially when done at home, is that it’s easy to remove the wrong hairs, creating holes or divots in the shape of the brow. Certain thicker hairs on the bottom line of the brow act as supportive “scaffolding” for the entire brow, so if you inadvertently remove the wrong hairs, the whole shape collapses. Then you are left with trying to camouflage your mistake until the hairs grow back. Threading eliminates this common mishap. • Less messy and time consuming than waxing. • Hair does not grow back as fast. • The skin doesn’t usually get red and irritated. • Threading can target individual hairs. • Hair only needs to grow just above the skin to get threaded. • Over time, hair becomes finer and more sparse. • Threading will pick up the finest hairs from the surface of the skin. • Excellent option for those who use RetinA, and Accutane.